There are eight euro coin denominations, ranging from one cent to two euros (the euro is divided into a hundred cents). The coins first came into use in 2002. They have a common reverse, portraying a map of Europe, but each country in the eurozone has its own design on the obverse, which means that each coin has a variety of different designs in circulation at once. Four European microstates which use the euro as their currency also have the right to mint coins with their own designs on the obverse side. The coins, and various commemorative coins, are minted at numerous national mints across the European Union to strict national quotas. Obverse designs are chosen nationally, while the reverse and the currency as a whole is managed by the European Central Bank (ECB). The euro came into existence on 1 January 1999. It had been a goal of the European Union (EU) and its predecessors since the 1960s. 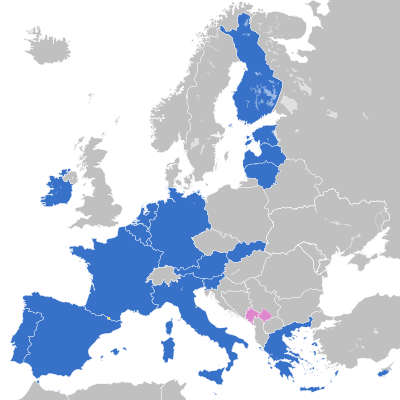 The Maastricht Treaty entered into force in 1993 with the goal of creating economic and monetary union by 1999 for all EU states except the UK and Denmark (even though Denmark has a fixed exchange rate policy with the euro). In 1999 the currency was born virtually and in 2002 notes and coins began to circulate. It rapidly replaced the former national currencies and the eurozone has since expanded further to some newer EU states. In 2009 the Lisbon Treaty formalised its political authority, the Eurogroup, alongside the European Central Bank. In 2004 €2 commemorative coins were allowed to be minted in six states. By 2007, all states but France, Ireland and the Netherlands had minted a commemorative issue and the first eurozone-wide commemorative coin was issued to celebrate 50 years of the Treaty of Rome. In 2009, the second eurozone-wide issue of a 2-euro commemorative coin was issued, celebrating ten years of the Economic and Monetary Union (EMU). In 2012, the third eurozone-wide issue of a 2-euro commemorative coin was issued, celebrating 10 years of euro coins and notes. To date, only Cyprus has not independently issued a €2 commemorative coin. As the EU's membership has since expanded in 2004, 2007 and 2013, with further expansions envisaged, the common face of all euro coins from the value of 10c and above were redesigned in 2007 to show a new map. Slovenia joined the eurozone in 2007, Cyprus and Malta joined in 2008, Slovakia in 2009, Estonia in 2011, Latvia in 2014 and Lithuania in 2015, introducing seven more national-side designs. Andorra started minting coins in 2014, so from 2015 there are 23 countries with their own national sides. There are eight different denominations of euro coins: 1c, 2c, 5c, 10c, 20c, 50c, €1 and €2. The 1c, 2c and 5c coins show Europe in relation to Asia and Africa in the world. The remaining coins show the EU before its enlargement in May 2004 if minted before 1 January 2007, or a geographical map of Europe if minted after. Coins from Italy, San Marino, the Vatican City, Austria and Portugal show the geographical map if minted in 2008 or later. The common side was designed by Luc Luycx of the Royal Belgian Mint. They symbolise the unity of the EU. The national sides were designed by the NCBs of the eurozone in separate competitions. There are specifications which apply to all coins such as the requirement of including twelve stars. National designs were not allowed to change until the end of 2008, unless a monarch (whose portrait usually appears on the coins) dies or abdicates. National designs have seen some changes due to a new rule stating that national designs should include the name of the issuing country. The common side of the 1c, 2c and 5c coins depict the denomination, the words 'EURO CENT' beside it, twelve stars and Europe highlighted on a globe in relation to Asia and Africa in the world. The common side of the 10c, 20c and 50c coins currently depict the denomination on the right, the words 'EURO CENT' underneath it, with twelve stars and the European continent on the left. Coins minted from 1999 to 2006 depicted only the EU15, rather than the entire European continent, which is on coins minted after 2007. The common side of the €1 and €2 coins depict the denomination on the left, the currency, map of Europe and twelve stars on the right. Similarly, coins minted from 1999 to 2006 depicted the EU15, rather than the whole European continent, which is on coins minted from 2007. All coins have a common reverse side showing how much the coin is worth, with a design by Belgian designer Luc Luycx. The design of the 1c, 2c and 5c coins shows Europe's place in the world as a whole. The 10c coins and above show either the 15 countries that were the European Union in 2002, or, if minted after 2007, the whole European continent. Coins from Italy, San Marino, the Vatican, Austria and Portugal show the new design if minted 2008 or later. The coins symbolise the unity of the EU. On 7 June 2005, the European Council decided that the common side of the 10c to €2 coins should be brought up to date to reflect the enlargement of the EU in 2004. The 1c, 2c and 5c coins show Europe in relation to the rest of the world, therefore they remained unchanged. In 2007, the new design was introduced. The design still retains all elements of the original designs, including the twelve stars, but the map of the fifteen states is replaced by one showing the whole of Europe as a continent, without borders, to stress unity. These coins were not mandatory for existing eurozone members when introduced in 2007, but became so for every member in 2008. Cyprus is shown several hundred kilometres north west of its real position in order to include it on the map. On the €1 and €2 coins, the island is shown to be directly east of mainland Greece; on the 10c, 20c and 50c coins, it appears directly below Crete. The original proposal from the European Commission was to include Turkey on the map, but this design was rejected by the Council. The original designs of the 10c, 20c and 50c coins showed the outline of each of the 15 EU member states. Each state was shown as separate from the others, thus giving Europe the appearance of an archipelago. EU member states outside the eurozone (the United Kingdom, Sweden, and Denmark) were also depicted. Non-EU states were not depicted. On the €1 and €2 coins, the landmass appeared more cohesive although borders were indicated. As in current issues, all coins featured 12 stars in their design. The year featured on the coins can date back to 1999, when the currency was formally established (only Belgian, Finnish, French, Dutch, and Spanish coins were struck with the 1999 date). These countries traditionally strike coins with the year of minting rather than the year it was put into circulation. Researchers from the University of Zürich warned that an external ring of metal surrounding an inner pill of a different colour, as in the euro coins, can lead to the release of high levels of nickel, causing allergic reactions with people sensitive to the metal. The researchers also warned that the coins could contain between 240 and 320 times the amount of nickel allowed under the EU nickel directive. The obverse side varies from state to state, with each member allowed to choose its own design. Each of the eight coins can have the same design (such as Irish coins), or can vary from coin to coin (such as Italian coins). In monarchies, the national side usually features a portrait of the country's monarch, often in a design carried over from the former currency (e.g. Belgian coins). Republics tend to feature national monuments, symbols, or stylised designs (such as French coins). Engravings on the edge of the €2 coin are also subject to national choice. There are, however, some restrictions on the design: it must include twelve stars, the engraver's initials, and the year of issue. New issues must also include the name of the issuing country or an abbreviation of it. It may not repeat the denomination of the coin or the word euro unless it is in a different alphabet (such as on Greek coins). This rule is flouted by Austria. The national side was also to remain unchanged until the end of 2008, unless a monarch depicted on a coin died or abdicated (such as in the case of the Vatican's coins or Monegasque coins). Though they are not members of the EU, Andorra, Monaco, San Marino, and the Vatican City also have euro coins featuring a national side, but a considerable number of these coins are not put into general circulation by the authorities who instead sell them to collectors for prices higher than their face value. No territories associated with Eurozone countries are issuing their own euro coins. France and Netherlands have areas which have their own currencies. Denmark and the United Kingdom have areas which use the currencies of their home countries but issue their own versions of banknotes. These two countries are part of the EU but not the eurozone, and it is uncertain what would happen if any of them adopted the euro. From 2015 there are 23 countries issuing coins with their own national sides, making it 184 different euro coins, not counting annual differences or commemorative coins. The national sides of all denominations of the euro circulation coins should bear an indication of the issuing Member State by means of the Member State’s name or an abbreviation of it. The above paragraphs, from a European Commission Recommendation of 19 December 2008, in essence, exhorted five eurozone members to change their national designs. Finland and Belgium did so in 2007 and 2008 respectively while Austria, Germany and Greece have not announced any design changes as of February 2018. However, the regulation only stipulates 20 June 2062 as a deadline for revising designs. As of 2016[update], Belgium, Monaco, the Netherlands, Spain and the Vatican have all experienced a change in head of state and have revised their designs to reflect this and the new regulation where applicable. Euro coins have high-security machine-readable features. Sophisticated bi-metal and sandwich technologies have been put into the €1 and €2 coins. The 10c, 20c and 50c coins are made of Nordic gold, which is a unique alloy, difficult to melt and used exclusively for coins. The lettering on the edge of the €2 coin also protects it from counterfeiting. Euro coins were designed in cooperation with organisations representing blind persons, and as a result they incorporate many features allowing them to be distinguished by touch alone. In addition, their visual appearance is designed to make them easy to tell apart for persons who cannot read the inscriptions on the coins. The coins increase in size and weight with value. Of the eight denominations of euro coins, the three lowest denominations are small, resemble copper in colour and are quite thin and light. The next three denominations resemble gold in colour and are thicker as well as heavier. The highest two denominations are bimetallic, being generally larger and thicker than the lower denominations. There are also differences within each group. The 2 cent coin has a grooved edge to distinguish it from the 1 and 5 cent coins and also from the US penny, which has the same colour and diameter. Similarly, the 20 cent coin is smooth with seven indents to distinguish it from the 10 and 50 cent coins. Although there have been other currencies predating the euro that were specifically designed in similar ways (different sizes, colours, and ridges) to aid the visually impaired, the introduction of the euro constitutes the first time that authorities have consulted associations representing the blind and visually impaired before the release of a currency. Each state allowed to issue coins may also mint two commemorative coins each year from June 2012. From 2004 to May 2012, countries were only allowed to mint one coin per year. Only €2 coins may be used in this way (for them to be legal tender) and there is a limit on the number that can be issued. The coin must show the normal design criteria, such as the twelve stars, the year and the issuing country. Greece was the first country to issue a commemorative coin, and was followed by all but Cyprus and Ireland. However, in 2007 every eurozone state participated in the Treaty of Rome programme, where all member states issued a coin of similar design to commemorate the signing of the Treaty of Rome, the only difference being the name of the issuing country and the language of the text. This was repeated in 2009 in commemoration of the 10th anniversary of the Economic and Monetary Union. The design was selected by electronic voting by EU citizens. [dead link] The most recent common commemorative coin was issued in 2015 to commemorate 30 years of the European Union flag. In 2006, Germany began issuing a series of coins, the German Bundesländer series, showing each of the states of Germany on its coins; this will last until 2021. Spain started a commemorative coin series Patrimonio de la Humanidad de la UNESCO (UNESCO World Heritage) in 2010, commemorating all of Spain's UNESCO World Heritage Sites, which could continue until 2050. The order in which the coin for a specific site is issued coincides with the order in which they were declared a UNESCO World Heritage site. Malta issued a series of five €2 commemorative coins, all related to the Maltese constitutional history. The first coin was released in 2011 and the last coin was minted in 2015. A legacy of old national practice is the minting of silver and gold commemorative coins. Unlike normal issues, these coins are not legal tender throughout the eurozone, but only in the country where they are issued (e.g. a €10 Finnish commemorative coin cannot be used in Portugal). However, these gold coins are intended for collectors as their bullion value vastly exceeds their face value. Some silver coins, such as the German €10 commemoratives, are often available at banks and some retailers at face value. These coins, however, generally do not circulate but are kept by collectors. It is uncertain whether the Council of Ministers will grant them legal tender status elsewhere outside national boundaries, as San Marino, Monaco, and the Vatican City also issue this kind of coins. The Belgian 2.5 euro coin is a commemorative euro coin valid in Belgium first issued in 2015 with 70,000 coins minted. The coin commemorates the 200th anniversary of Napoleon's defeat in the Battle of Waterloo. Belgium originally planned to mint €2 commemorative coins for the occasion. This plan was blocked by France, however (after 180,000 of the coins had already been minted, they had to be discarded). Minting in the 2.5 euro denomination obviates France's complaints as the coins will not be legal tender in the European Union, they are only legal for currency in Belgium. EU law states that any country can issue any new coins it wants as long as they are in an irregular denomination, so it invented a €2.5 coin. As of Sep 2018, there are approximately 130 billion coins in circulation around the eurozone. In contrast the USA has minted over 300 billion pennies since 1983 when the current copper-plated zinc metallic composition began. Using a population of 339 million for the EU that is roughly 170 coins of denomination 1c or 2c per capita, and 185 other coins per capita. Approximately 100,000 counterfeit euro coins are taken from circulation annually, and roughly the same number are seized before they can be released. Given a total circulation of 56 billion coins, counterfeit coins are relatively rare. About half the counterfeits feature the German national design, but counterfeits have been detected for every issuing country. The majority of counterfeit coins are €2 (60% in 2011), with most of the rest being €1, and a few 50c coins. The number of counterfeit €2 coins being found annually is decreasing, while numbers of counterfeit €1 and 50-cent coins are increasing. The European Technical and Scientific Centre estimates that up to 2 million counterfeit coins were put into circulation in 2002. Recent investigations by the European Commission have shown that counterfeit sophistication is increasing, making prompt detection more difficult. In 2008, Irish MEP Eoin Ryan called for tighter regulation over tokens and medals that are being increasingly used for small purchases mainly in vending machines across Europe. The 1c, 2c, and 5c coins account for approximately 80% of all new coins minted in the eurozone. Due to the expense of producing such low value coinage, the Commission and some member states have proposed that costs could be cut by having a common design on both sides of these coins, rather than minting numerous different designs. The €1 and €2 coins are two-toned. The "gold" is an alloy, 75% copper, 20% zinc and 5% nickel. The "silver" is cupronickel, 75% copper, 25% nickel. The 10c, 20c and 50c coins are a proprietary alloy known as "Nordic gold", consisting of 89% copper, 5% aluminium, 5% zinc and 1% tin. The 1c, 2c, and 5c coins are copper-coated steel fourrées. The copper alloys make the coinage antimicrobial. The 1c and 2c coins were initially introduced to ensure that the introduction of the euro was not used as an excuse by retailers to heavily round up prices. However, due to the cost of maintaining a circulation of low value coins, by business and the mints, Finland, Ireland and the Netherlands round prices to the nearest five cents (Swedish rounding) if paying with cash, while producing only a handful of those coins for collectors, rather than general circulation. The coins are still legal tender and produced outside these states. Despite this, many shops in the Netherlands refuse to accept them. The Swedish rounding law in Finland was issued in January 2002 just shortly after the coins were put into circulation. The Netherlands followed suit in September 2004, with Belgium making moves to follow in 2005, but no mandatory rounding has been applied. The Netherlands did so under pressure from retail businesses, which claimed that dealing with 1- and 2-cent coins was too expensive. After a successful experiment in the town of Woerden in May 2004, retailers in the whole of the Netherlands have been permitted to round cash transactions to the nearest five-cent since September 2004. Belgium passed a rounding law in February 2014, but it is generally ignored. Ireland did so in 2015 after trialling rounding in Wexford in 2013. In May 2017, the Italian parliament has passed a resolution to stop minting 1c and 2c coins starting 1 January 2018 as well as introducing Swedish rounding. This is in part due to factors such as rising metal prices: De Nederlandsche Bank calculated it would save $36 million a year by not using the smaller coins. Other countries such as Germany favoured retaining the coins due to their desire for €1.99 prices, which appear more attractive to the consumer than a €2 price. Luxembourg and Malta have also declared they do not wish to remove the coins. This is echoed by the European Central Bank itself which supports the coins, stating it allows businesses to calculate prices more exactly to attract consumers, such as €0.99. According to a Eurobarometer survey of EU citizens in 2005, Germans were most sceptical about the removal of the 1c and 2c coins from complete circulation in the eurozone, but on average there was a majority for their removal (58% for the one cent coin and 52% for the two cent coin in 2005). The Belgians were most supportive of their removal. A similar survey in 2017 found 64% across the Eurozone wanting their removal with prices rounded; with over 70% in Belgium, Ireland, Italy, the Netherlands and Slovakia. Only Portugal and Latvia had a plurality in favour of retaining the coins (49% against removal, 45-6% in favour). The Commission in 2010 released its guidelines on daily life euro cash questions, to give citizens guidelines on such issues with direct implications on their daily lives. These guidelines are based on ten guiding principles. Two of these guiding principles were and still are that "No surcharges should be imposed on payments in cash" and "Member States should not adopt new rounding rules to the nearest five cent". In spring 2016 controversy arose in the Netherlands after an episode of the television program Keuringsdienst van Waarde showed that euro coins from the Netherlands and other countries are produced by the South Korean company Poongsan. This company is also a known producer of cluster munitions. Cluster munitions are banned internationally by the 2008 Convention on Cluster Munitions (CCM), because of their indiscriminate and long-term effects on civilians. The CCM prohibits the use, production, stockpiling or transfer of cluster munitions as well as assistance with these acts. After parliamentary questions were posed, the Dutch government stated that the Royal Dutch Mint had ordered around 40 million 'coin blanks' between 2011 and 2016, and that Poongsan was on a list of vetted suppliers of the European Commission's Mint Directors Working Group. Since then, both the Royal Dutch Mint and the Norwegian Mint have excluded Poongsan as a coin blank supplier due to its involvement in cluster munitions. In the European Parliament, questions were also raised about Poongsan's presence on the vetted list of coin blank suppliers of the European Commission's Mint Directors Working Group. However, the Commission claimed responsibility on this issue lies with the member states of the Union. ^ Bank, European Central. "Coins". European Central Bank. ^ a b c d "ECB: Introduction". ECB. ECB. ^ "FT.com – The history of the euro". Financial Times. Financial Times. 21 May 2002. Archived from the original on May 10, 2013. Retrieved 13 February 2013. ^ "History of the Eurogroup - Eurozone". Eurogroup. eurozone.europa.eu. Archived from the original on 2013-07-15. Retrieved 2 July 2013. ^ "ECB: 2004". ECB. ECB. Retrieved 2 July 2013. ^ * "France - European Commission". European Commission. European Commission. Retrieved 2 July 2013. "Ireland - European Commission". European Commission. European Commission. Retrieved 2 July 2013. "The Netherlands - European Commission". European Commission. European Commission. Retrieved 2 July 2013. ^ "ECB: 2007". ECB. ECB. Retrieved 2 July 2013. ^ "ECB: 2009". ECB. ECB. Retrieved 2 July 2013. ^ "ECB: 2012". ECB. ECB. Retrieved 2 July 2013. "Cyprus - European Commission". European Commission. European Commission. Retrieved 2 July 2013. "Estonia - European Commission". European Commission. European Commission. Retrieved 2 July 2013. ^ * "The 2004 enlargement: the challenge of a 25-member EU". EUROPA. europa.eu. Retrieved 2 July 2013. "EU2007.de - Continuing the enlargement process". EU2007.de. EU2007.de. Archived from the original on 2009-07-15. Retrieved 2 July 2013. Stiks, Igor (1 July 2013). "Croatia has become the latest member of the EU periphery". The Guardian. Retrieved 2 July 2013. ^ a b c d e f g h i j k l m "ECB: Common sides". ecb.int. European Central Bank. Retrieved 28 June 2013. ^ "ECB: Map of euro area 1999-2011". ECB. ECB. Retrieved 2 July 2013. ^ a b c "ECB: Coins". ECB. ECB. Retrieved 1 July 2013. ^ a b "Common guidelines: the national sides of euro coins". Europa. europa.eu. 19 January 2007. Retrieved 1 August 2013. ^ a b c d e "Euro coins - European Commission". Europa. ec.europa.eu. 14 May 2013. Retrieved 1 August 2013. ^ "BBC NEWS Health Euro coins 'trigger allergy'". BBC News. bbc.co.uk. 12 September 2002. Retrieved 1 August 2013. ^ a b "Five years of Euro banknotes and coins". Europa. europa.eu. 17 January 2007. Retrieved 1 August 2013. ^ "The euro outside the euro area". ec.europa.eu. 5 July 2011. Retrieved 10 September 2011. ^ "No design change for Austrian and German euro coins (in German)" (Press release). www.zwei-euro.com. 2008-02-01. Retrieved 2008-02-01. ^ "COUNCIL REGULATION (EU) No 566/2012" (Press release). Council of Ministers of the European Union. 2007-06-20. Retrieved 2016-04-30. ^ a b c d "ECB: Security features". ECB. ECB. Retrieved 2 July 2013. ^ "Spanien: Weitere Ausgaben der 2-Euro-Gedenkmünzenserie "UNESCO-Weltkulturerbestätten"". 2010-01-19. Retrieved 2010-01-20. ^ "Commemorative coins 2011 - ECFIN - European Commission". Ec.europa.eu. Retrieved 2011-04-10. ^ Bilefsky, Dan (9 June 2015). "Belgium Commemorates Waterloo With a Coin, and France Is Not Pleased". The New York Times. ^ Jason Karaian. "France’s whining won’t stop Belgium from minting coins commemorating the Battle of Waterloo". Quartz, 9 June 2015. ^ Euro coin row: France wins the battle, Belgium wins the war The Guardian June 10, 2015. ^ a b "ECB: Circulation". European Central Bank. European Central Bank. September 2018. ^ a b c d e "EU-wide progress on tackling euro coin counterfeiting in 2017". Europa.eu. Retrieved 2019-02-17. ^ "EUROPA - Press Releases - Euro coin counterfeiting in 2012". Europa.eu. Retrieved 2019-02-17. ^ "EUROPA - Press Releases - Euro coin counterfeiting in 2011". Europa.eu. Retrieved 2012-05-24. ^ "EUROPA - Press Releases - Euro coin counterfeiting in 2010". Europa.eu. Retrieved 2011-09-08. ^ a b "EUROPA - Press Releases - Euro coin counterfeiting in 2009". Europa.eu. Retrieved 2011-04-10. ^ a b c "EUROPA - Press Releases - Euro coin counterfeiting in 2007". Europa.eu. Retrieved 2011-04-10. ^ a b c "European Commission - OLAF - EURO COIN COUNTERFEITING IN 2004". European Commission. ec.europa.eu. 18 January 2005. Retrieved 22 July 2013. ^ "'Most sophisticated' fake euro coin network uncovered in Italy". Archived from the original on 2008-04-05. ^ ""Euro coins need protection," says Irish MEP Eoin Ryan". European Parliament. europarl.europa.eu. 1 December 2013. Retrieved 1 August 2013. ^ a b "Consumer coins". Copperinfo.com. 2002-01-01. Retrieved 2011-07-17. ^ "What is Nordic Gold". Copperinfo.co.uk. Archived from the original on 2011-07-25. Retrieved 2011-07-17. ^ "Save the penny or leave the penny? - Business - CBC News". CBC News. www.cbc.ca. 15 December 2010. Retrieved 1 August 2013. ^ a b "Page Not Found (404) - Central Bank of Ireland". www.centralbank.ie. ^ Castle, Stephen (September 16, 2004). "Smallest Euro coins dropped by two nations". Independent, The (London). Archived from the original on January 24, 2007. Retrieved 2008-07-15. ^ "Written Answers 23960/13: Euro Coins Production". Dáil debates. Oireachtas. Unrevised: 57. 21 May 2013. Retrieved 26 May 2013. ^ "Italia, addio alle monetine da 1 e 2 centesimi". Corriere del Ticino (in Italian). 27 May 2017. Retrieved 2017-05-28. ^ (www.dw.com), Deutsche Welle. "Italy to stop producing 1- and 2-cent coins - DW - 29.05.2017". DW.COM. ^ Tiplady, Rachel (22 September 2004). "Small Change, Big Annoyance in Europe - Businessweek". Bloomberg Businessweek. www.businessweek.com. Retrieved 1 August 2013. ^ "1c and 2c coins here to stay". maltatoday.com.mt. ^ "The euro, 4 years after the introduction of the banknotes and coins" (PDF). Eurobarometer. ec.europa.eu. November 2005. Retrieved 1 August 2013. ^ "Euro legal tender - European Commission". Ec.europa.eu. Retrieved 2013-03-26. ^ "Keuringsdienst: De industrie achter clustermunitie". npo.nl. ^ Staten-Generaal, Tweede Kamer der. "Antwoord op vragen van de leden Merkies en Jasper van Dijk over de productie van euromunten door een Zuid-Koreaans bedrijf dat ook betrokken is bij de productie van clustermunitie". zoek.officielebekendmakingen.nl. ^ Investment, Stop Explosive. "Home - Stop Explosive Investments: Help stop the funding of cluster bomb producers". www.stopexplosiveinvestments.org. ^ "Written question - Production by South Korean company Poongsan of cluster munitions and Euro coin blanks - E-007032/2016". www.europarl.europa.eu. Wikimedia Commons has media related to Euro coins.